This Amish Le Chateau Chifforobe is elegantly designed to create a tie with the past as well as a promise of an heirloom in the future. The drawers are dovetailed for years of everyday use. It is available in oak wood or cherry wood and handcrafted by experienced woodworkers in Lancaster, PA. The image shown is cherry wood with Bordeaux stain. 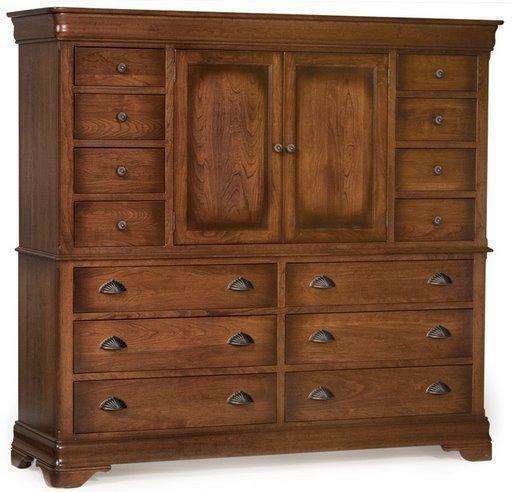 Give your bedroom the look and comfort of a village inn with the Amish Le Chateau Chifforobe. This product takes about 8-12 weeks to complete. Our Amish handcrafted Le Chateau bedroom furniture pieces will be a beautiful addition to your master bedroom.